Sponsored Chapter to get you guys go splat off a high altitude rock. If possible please add this to your Novel Updates Reading List do leave a review as well. In just a short moment the pub was filled with the clashing of metal1. Patelisi was the most miserable of the four, as not only was he an archer but a male eagle tribe archer on top of that; an eagle trapped indoors was no different from a chicken awaiting slaughter, and he could only use all of his might to dodge. The others were immediately assaulted as well, and though these thieves’ equipment was very poor, they all had one or two pieces that made it impossible for Ke Te and the others to worry about the others instead of themselves. Chabu pressed towards the three noncombatants step by step, the Beast Spirit imprint on his head flashing as the entire bronze-grade set appeared on his person. The kind of dignified feeling and suppression from him was very different from the others, and what frightened people the most was the silver-grade dagger he held in his hand. It could be said that not a single person here could block a single slice of his; a complete attributed silver-grade dagger had 1~9 Attack, and even if Chabu only had 1~8 he would still be able to casually slice through plain-grade equipment. “Ai Wei Er, you guys quickly run! Leave this place to us!” Ke Te exploded with a bark, immediately inviting multiple random hacks from the thieves’ blades. “Little sister, don’t be scared, don’t be scared. I won’t hurt you,” Perverted Fox Chabu squinted in merriment. Against the mighty bronze-grade Shadow Hunter, this timid Bi Er priest in training pulled the two girls back step by step. If someone was to look at his appearance, they would notice his legs were even trembling. Ao Li Quan Ya was completely different from Ai Wei Er and was filled to the brim with vigor. If it was not for Zou Liang dragging this damsel, she probably would have already rushed out and tried to give the opponent a beating herself. Chabu believed that this Bi Er had nearly wet his pants in fear. With such a terrified appearance, this kind of moron in the eight cities must have bought his priest status with money. “Hit me! Hit right here!” Chabu knocked against his armour, emitting a pengpeng sound. Even if someone was to use their teeth, they would not be able to even slightly chew through such a thing. “Don’t come closer! If you come any closer, I’ll kill someone! I’m an expert!’ Zou Liang threatened with the voice of a wolf in sheep’s clothing, continuing to pull Ai Wei Er and Ao Li Quan Ya in retreat. Even so, everyone could hear his inner trembling. In truth, this bronze-grade Shadow Hunter—especially in an environment like this—was practically invincible. 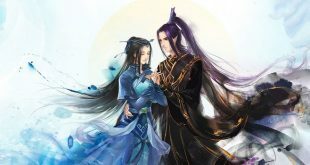 Ke Te and Lan Di’s hearts were aflame. They didn’t understand what was wrong with AI Wei Er to find this kind of wimp; no matter how good his talent in Spirit Engraving was, he could only be taken as a friend. Beastmen could only be killed, not disgraced! Just as Ke Te and Lan Di were grimacing with their entire belly on fire, just when Ou Nisi Te was about to put his life on the line to save Ya Se, Chabu lashed out with his hand. An arrow of blood pierced out. The thieves’ expressions were fierce, yet this ferocity very quickly turned into shock and disbelief. Chabu’s neck had a knife embedded in it—an Engraving Knife. It had pierced the exposed neck between the helmet and the armor, and now another knife—Chabu’s—was pierced in a spot ten or so centimeters away. Ka Te emitted a Lai Yin’s lion-like roar while the thieves’ mental state was not stable before killing a thief with a single strike. At the same time, Lan Di had soundlessly erased a thief with a strike to the neck. They were both recognised experts of the occupational guilds’ youths; how could they miss such an opportunity? Following Zou Liang’s call, Ou Nisi Te—who was being attacked by this band of thieves and only knew how to defend—retracted his shield and released a mountain-quaking bear roar, followed by his sole killing technique——Clasping Avalanche! With his large body size, two thieves were immediately knocked flying and blood flew everywhere. To Zou Liang’s eyes, this was just like a collision with a train. Fierce and straightforward. When Ou Nisi Te used the Clasping Avalanche, it did not matter what he was up against, he would just collide straight into it. Unfortunately there wasn’t much space to dodge in this room, so each collision would hit a large area. The original main attacking force of Ke Te and Lan Di very intelligently changed to more supportive-offense roles, and soon the entire room of thieves had pretty much been killed. Only a few remained, already kneeling down to the ground in surrender. “Delightful, absolutely delightful!” Ke Te barked out: this was the habit of the Lai Yin tribe. “Stop yelling you moon-faced cat, it’s not like it was your credit,” Lan Di said while shaking his head, glancing at the Chabu who hadn’t understood the final moments leading up to his death. This Ya Se’s luck was pretty good; if the attack did not veer off and had landed squarely—even if a Shadow Hunter had been focused on attack—it would be difficult to strike them in the vitals. Since he was a Shadow Hunter, himself, he could only view this as an absurd error on Chabu’s part. “Coincidence?” Lan Di looked at Ya Se. “I also wish that this was done on purpose,” Ya Se smiled. They had not spoken for long before a large group of people rushed in, causing Zou Liang’s heart to sink. F**k, there wasn’t going to be another fight, right? Once Lan Di and the rest saw the uniform, however, they were all delighted; this was Ye Lu Samo City’s civil defence, and the leader of the force was also someone they knew. “Older Brother,” Ke Te smiled. Masite (Mǎsītè)—the leader of Ye Lu samo City’s civil defence—was an influential figure of the city. He was twenty years old, upright and mature, and he was even rumored to be the most excellent of lovers in the eyes of the upper-class women. Masite’s eyes wandered over the thieves littered all over the floor. Especially when his eyes passed over Chabu, they flashed in surprise. Zou Liang felt a tinge of melancholy; it didn’t matter which world it was, the police would still have to clean up the mess. Once Masite had heard that Ya Se had killed Chabu with a single jab of his dagger, he was also endlessly amazed while sighing at the other’s luck. Ya Se’s name had already been spread over the upper echelons of Ye Lu Samo City even before this. “Leader Masite, does this fellow have any bounty on his head?” Ya Se asked in a simpering manner, his heart thankfully not forgetting to try for some profits. “Relax, Priest Ya Se.” Masite was also a clever person, and though he was fully aware of the other party’s slight sarcasm, he still gave a happy smile; in this period, it was permissible to offend anyone except for the temple. As soon as the Dual Engraving Method had been released, many people with some confidence wished to try it, making offending the Ye Lu Samo Temple a very unwise decision. On a stage like this, it was likely that only Zou Liang and Ou Nisi Te would be concerned with money. Everyone else had come from wealthy families, but the thing the two brothers lacked the most when they were brought into this world was money. Hearing there was fifty gold coins, Ou Nisi Te’s large mouth cracked open in a smile like a lily. Indeed, his older brother was a capable one. After observing these brothers that were praising the Heavens over fifty gold coins, the others’ vision moved to Perverted Fox Chabu’s body. This was indeed something that stirred the heart. Chabu’s ability was one thing, but the most prominent characteristic was that this person was a perverted thief. There had been many females from nearby cities that had vanished thanks to this person, and the people’s hearts were furious. They had prepared a net with difficulty and were working to lure him in, but…… Ai, the temple once again gained more face and prestige. Seeing Chabu’s protruding eyes and shocked face, one could only imagine the melancholy he had felt before death. When heading out, luck was still a factor.